VRCP DrvInfo is a powerful, user-friendly piece of software that retrieves information regarding your computer’s local drives and other storage devices. 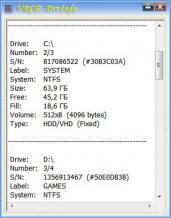 The program is portable so you can directly run the executable, even from an external storage such as USB drives. Among the drive-related information you can view a wealth of related information like the volume, system type, serial number, size, disk type and label. VRCP DrvInfo was designed with simplicity in mind, thus you can use it with no need to edit its default settings. Some changes may occur while you’re using the app. In that case you can use the F5 key to refresh the program. The tool also has a context menu which you can access by clicking on the top left corner of the interface. There, you can refresh the information, and open the Help documentation among other things.